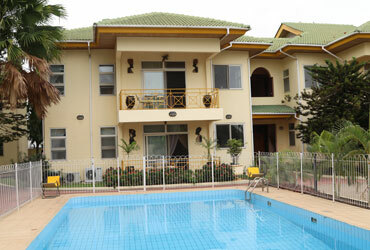 Oasis Lodge is the epitome of luxury and privacy comprising eight fully furnished flats located at the luxurious Airport Residential area, Accra. At Oasis Lodge, our goal is to provide the perfect environment for our guests who are especially desirous of living in a “Home” while on vacation or business trip to Accra. We aim to improve the facilities we offer, our service and your surroundings to ensure you and your family enjoy the very best of both worlds. We understand the difference of just living and living well. 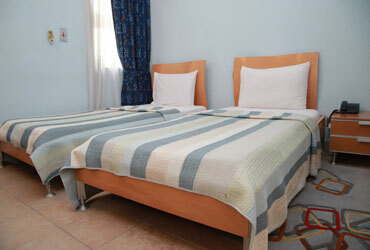 Just about 5 minutes drive from Accra International Airport lies Oasis Lodge set along a quiet and secure road. These are the kinds of suites available to guests -a -three bedroom and two bedroom suite, each having a terrace while all three bedroom suites have master suites styled for seclusion while the interior design gives a feeling of space and freedom. An suites are served with dedicated direct telephone lines and fully fitted kitchens. There is also a large swimming pool coupled with a modern gymnasium. Our suites are special indeed, reflecting a quality of life treasured by many and enjoyed by only a privileged few. They are the culmination of a focus of intention which attends, not only to superb design, but also to the quality and richness of materials. 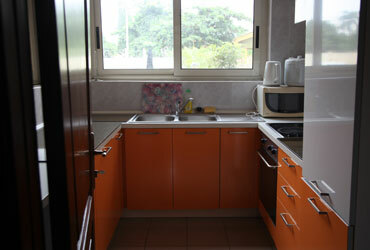 All kitchens are fitted with the requisite cookware and the most modern kitchen appliances. Nevertheless guests who are not desirous of doing their own cooking can order meals via our central kitchen. Guests can enjoy their accommodation in a privileged surrounding and with a guarantee that you can get medical attention 24hrs a day if needed. Oasis Lodge is only 2 minutes drive from the prestigious Nyaho medical centre which operates around the clock. Whatever you are looking for on a holiday or a business trip to Accra, Oasis Lodge is sure to whet your appetite; and with so much to enjoy, you will return again and again. On arrival at Accra International Airport, you will be met by our friendly shuttle van which will take you to your luxury suite. ©2019 Oasis Lodge | The Epitome Of Luxury Accommodation.